Ever wished for china that matched the exact color of your dining room walls? Custom plates are the solution. Here, top artisans to fulfill your fantasies. Londoners Jo Brickett and Mair Davda create impossibly thin earthenware bowls, plates and platters. All pieces are one-of-a-kind, so customers like pop star Gwen Stefani, who ordered her wedding china from the pair, can personalize the hand-drawn etchings. Details Minimum order $500 for 12 pieces; 011-44-20-8969-3239 or brickettdavda.com. Originally trained as an architect, Paris-based Pinto will create custom dishware for interior-design clients and companies such as Raynaud. Earlier this year, he started his own hand-painted porcelain line, including "Envol," to make his designs more widely available. 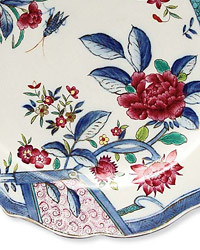 Details From $96 for "Envol" dinner plate; 011-33-1-40-13-00-00 or albertopinto.com. A New York painter whose influences include Francis Bacon and Henri Matisse, Albertini paints Italian bisque on both sides so that, for example, a coral branch connects from the inside of a bowl to the outside. Details From $45 per mug, and $90 per dinner plate, minimum of six per order; serving pieces from $90, no minimum; 631-907-9371 or albertinistudio.net. A former antiques dealer who specialized in European porcelain, Brooklyn-based Fenichell has made replicas to fill in incomplete china services for clients, designed a custom tea set decorated with historical prints and edged in 20-karat gold (above) for Audubon House museum in Key West, Florida, and more. Details $4,500 for Audubon House tea set; 718-237-2490 or store.bespokeporcelain.com. From her atelier in Paris, Amoruso-Manzari takes custom orders for her beautifully delicate china, hand-painted with natural pigments. Botanical designs and architectural renderings are a specialty. Amoruso-Manzari has even re-created Catherine the Great’s intricate pattern for a 700-piece set. Details From $90 a plate, no minimum; artgam@tiscali.fr. Many of Daâge’s designs are available off-the-rack, but individuals can also order custom pieces through an interior designer or architect from her Paris studio, like the gold-rimmed tea set covered with mauve hearts she created for British interior designer Nina Campbell. Details Price upon request, no minimum order; 011-33-1-44 90-01-36 or mariedaage.com.